Lorde touched down in New Zealand, her homeland, on Tuesday, following Sunday's Grammy Awards. Not only did the 17-year-old singer return home with TWO Grammy Awards in tow, but she took out an entire page in the New Zealand Herald on Jan. 28 to thank her fans for their support! Lorde, who won awards for Song of the Year and Best Pop Solo Performance, is so appreciative of her fans -- we love it! Lorde also said she couldn't wait for last night's show in Auckland. We hope she kept her promise and made "magic" onstage at Silo Park on the waterfront. 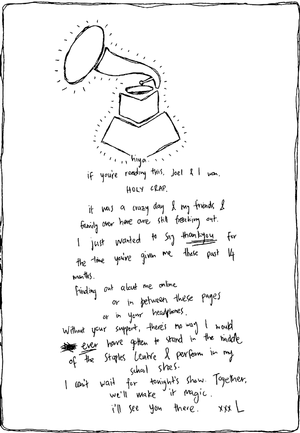 PHOTO: Lorde's letter to her fans after her Grammy win. "Look at the last 12 months, it's a pretty amazing achievement and the Grammys are a recognition of that, it's going to be a magic night," she wrote in her letter on Jan. 28. Do you think more celebrities should write thank you letters like Lorde?